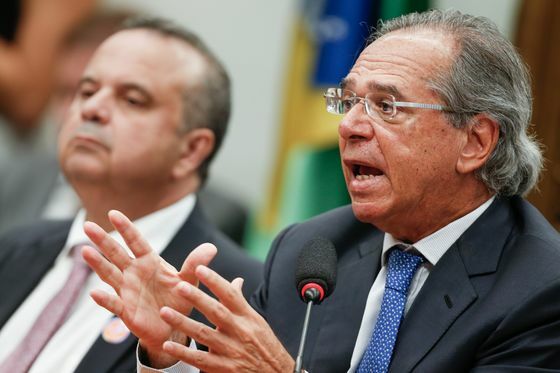 (Bloomberg) -- Brazilian Economy Minister Paulo Guedes said he’ll clear up any confusion from President Jair Bolsonaro’s decision to halt a planned fuel-price hike by Petroleo Brasileiro SA. When asked about Bolsonaro’s meddling in state-controlled Petrobras’ pricing policy this week, Guedes said he’d get more information when he returns home from Washington, where he’s been attending the spring meetings of the International Monetary Fund. Petrobras shares plunged more than 8 percent on Friday after Bolsonaro called the energy producer’s Chief Executive Officer Roberto Castello Branco and ordered him to cancel a planned increase in diesel prices. Bolsonaro’s hastily-made decision sent shockwaves across Brazilian markets as it revived fears of the interventionist policies by previous Brazilian governments that analysts blame for fueling inflation and hurting the economy in recent years. A massive trucker strike hit the country a year ago when diesel prices were finally allowed to go up. Since then, the government temporarily subsidized diesel, and Petrobras has started adjusting its prices more sparingly. Late on Friday, Bolsonaro’s spokesman said the president understands that Petrobras is a publicly-held company subject to market rules, and that it shouldn’t be subject to political interference. Bolsonaro, elected in 2018 on a pro-business platform after years of leftist governments, plans to meet again with the Petrobras CEO and some of his ministers on Tuesday to discuss the situation with truck drivers.